How does Geoff Duke stack up against Joey Dunlop? 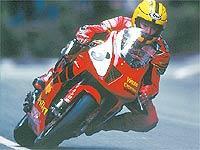 Or Steve Hislop compare to Stanley Woods. Who is the greatest TT racer ever? MCN reveals our top 10 in a free 16-page TT preview, only with MCN out Wednesday, May 26. The preview is also a celebration of 100 years of riding the mountain circuit and comes complete with a record of all the historic milestones along the way, our tips on the men to watch at this year’s Isle of Man festival and a tribute to Dave Jefferies, a year after his loss. We look in the changes in the bikes and the kit used through the decades and include a full timetable and vital facts for visitors. If you’ve ever been, are planning to go, or always dream of making the trip to the TT, don’t miss it. You haven’t left it too late if you want to experience this year’s TT. You can join in an MCN day trip by calling 08457 585 833. Prices are £51 per adult, £30 per child. The package includes return ferry travel as a foot passenger from either Heysham or Belfast, breakfast and coach transfer to vantage point. Here are your options: Saturday June 5, departing Belfast at 23:59 Friday night departing Douglas at 20:15. Saturday June 5 departing Heysham 01:45 departing Douglas 19:15. Saturday June 5, departing Heysham 02:15 departing Douglas 19:15. Monday June 7, departing Heysham 01:45 departing Douglas 19:45. Wednesday June 9, departing Heysham 01:45 departing Douglas 19:15. Friday June 11, departing Heysham 01:45, departing Douglas 19:15. Friday June 11, departing Heysham 02:15, departing Douglas 19:45.